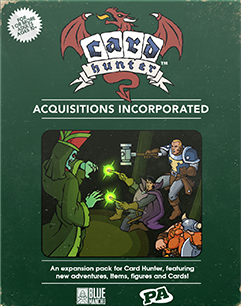 Acquisitions Incorporated Opens its Cardhuntria Office! We’ve been teasing you about our “AI” expansion for the past couple months, and it’s finally here. Blue Manchu and Penny Arcade have teamed up to bring you six new adventures based on the Acquisitions Incorporated role-playing sessions. In these adventures you’ll control Omin Dran, Binwin Bronzebottom, and Jim Darkmagic as they quest for profit in Cardhuntria. Interview potential interns, shop for cemetery ornaments, and save the day at a deliciously dangerous wedding in a series of battles that introduce completely new gameplay mechanics to Card Hunter. Get acquiring now! Omin, CEO of Acquisitions Inc., is a half-elf cleric whose singular obsession is corporate dominance. Binwin, the dwarf berserker who moonlights as an ale brewer, specializes in cracking skulls. And Jim, ever the narcissistic troublemaker, is a human wizard who’s often more magician than mage. This trio has expanded their franchise into Cardhuntria and quickly run into finance troubles. Will their new office make it into the black? 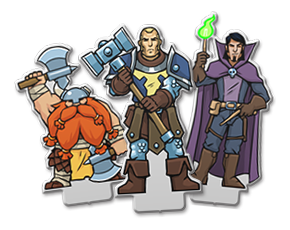 Acquisitions Inc. expands the Card Hunter campaign with three treasure hunts and three bonus adventures to challenge players. The new treasure hunts are revealed when you successfully raid the Viscous Tombs (level 10) or defeat the Goblins in the Woods (level 11). Alternatively, they will reveal immediately if you purchase the new AI bundle — which includes all six adventures, three new figures, and a month’s membership in the Card Hunter Club, all for the low price of $5.99. • Preconstructed Treasure Hunts: The main storyline of the expansion takes place over three treasure hunts in which you control Omin, Binwin, and Jim using prebuilt decks. Being treasure hunts these adventures each provide an epic item reward upon completion. Because these adventures use preconstructed decks, you can play them regardless of what stage of the campaign you are at. • Hard Mode Challenges: Beating each of the main adventures unlocks a special “hard mode” challenge adventure in which you play through the same battles using your own party. Some of these battles include harder monsters, so beware. These challenge adventures guarantee a rare item on each completion and also include five quests each to baffle skilled players. Hard mode challenge adventures are pitched at level 12. 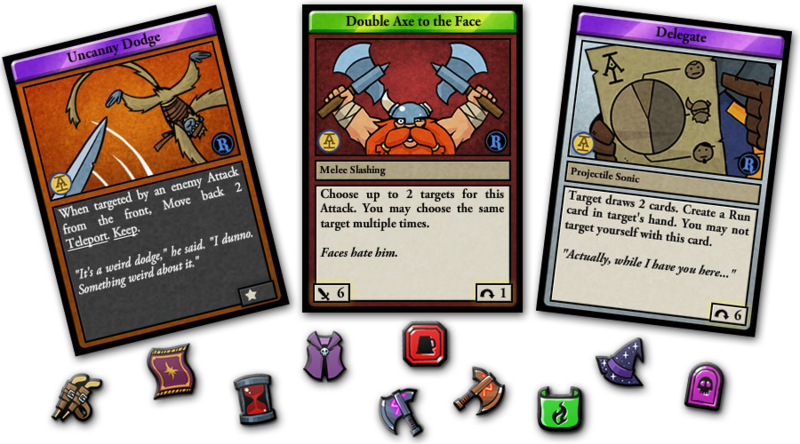 • Caverns of Chaos: With the arrival of Acquisitions Inc. in Cardhuntria, the Caverns of Chaos will now include traps, denizens of the Negative Energy Plane, animated food, and more! Also, rumor has it that Omin, Binwin, and Jim might randomly show up in the caverns… These changes to the Caverns of Chaos affect all players, whether or not they buy the new adventures. If you don’t feel like purchasing the Acquisitions Inc. bundle, you can purchase the new treasure hunts individually with pizza. And, of course, you’ll be able to access the corresponding hard mode challenge adventure for each treasure hunt you’ve purchased. Four new ranked boards are rotating in as part of the expansion. These boards either necessitate or reward emphasizing movement in your deckbuilding. Good luck mastering these new battlefields! We’re also introducing four new leagues: Office Mixup, Smash the Jar, Musical Chairs, and Filing Fracas Quick Draw. We’re not missing a beat this month with Mauve Manticore #15 and Aloyzo’s Arsenal #8 coming out in tandem with the expansion. This month’s Mauve Manticore is a bit trickier than the last several, but we trust you’ll find it a worthwhile challenge as it guarantees TWO epic drops on completion — Magic Elves’s Pressing Problems and Adunien’s Mad Centaur Spear. We are always on the lookout for great adventure and item submissions from our fans, so send something in today!